The Giant Wheel is a spinning wheel. It is average speed, it is fun, rerideable, it has a large capacity, and a long duration. It also provides a good view of the park. A ferris wheel is a ferris wheel. You ride one you rode them all. Pretty much. Still good though. I absolutely hate Ferris Wheels because they scare me. This one is beautiful though, and offers a great view of the park, especially at night. Definitely worth taking a ride on. Fun and relaxing ride, and as stated before the tallest in PA. Very nice view, colorful gondolas and a great lighting package! The one thing Ive always wondered about was the lack of a centerpiece for such a large wheel (ex. Dorney has the Pepsi logo, some parks have the parks logo, etc). Its not a big deal or anything, just a curiosity. The Wheel is another relaxing ride, even though you cant see deep into the park. However, it is fun to watch the Power Surge and Downdraft move. The "Wheel Boys" do let you on for ever and do a great job in unloading and loading the wheel, espially when there is no brake. This Ferris Wheel was pretty good, though the loading and unloading was very inefficient. 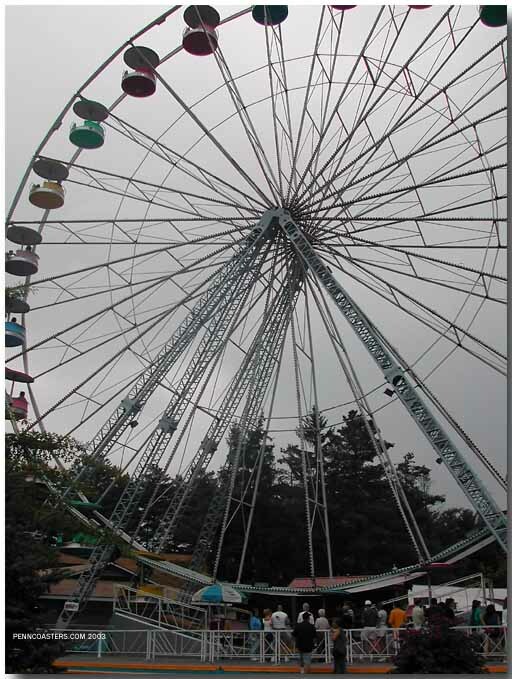 Although it could be taller, this ferris wheel doesnt just give you views of the park--it also gives you views of the trees and stuff outside Knoebels. Its also very colorful. No stupid cages like the ones at Funtown Pier. This is a magnificent wheel and the second best ferris wheel that Ive ridden. Knoebels Giant Wheel is a fun Ferris wheel towards the very front of the park. Standing 110ft tall, the Giant Wheel is the tallest Ferris wheel in Pennsylvania. With multi-colored cars, the Giant Wheel looks great. The Giant Wheel has a massive capacity. Generally the wait is around 10 minutes because of a very long ride cycle. Knoebels runs their Ferris wheel longer than any other Ferris wheel I have been on. Boarding the gondolas, you are loaded quickly. During the ride you get some great views of the front area of the park. My favorite thing to watch is Sklooosh! when it makes the mammoth wave. Also, you get some great views of Downdraft and Power Surge. You cant see too much because of some trees near the ride. Overall, a fun Ferris wheel that any Ferris wheel lover shouldnt miss. A great way to see the front area of the park, first-comers to the park or those who want to see what rides they want to ride should ride this first. This is a great relaxation ride. I love ferris wheels... and this one is no exception. Very high, nice view, beautiful painjob, and nice loading time. Not much else to say. Nice smooth ride and great view of the park and countryside. Beautiful paint job too.